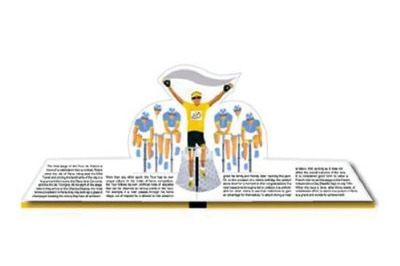 Thanks to Bike Blog NYC we were tickled to discover that there is a Tour de France pop up book for kids. Created by Pamela Pease, ‘Pop-Up Tour de France: The World’s Greatest Bike Race’ presents a history, guide and celebration of the 200 cyclists in the Tour de France. With pop-up cyclists! And pop-up mountains! 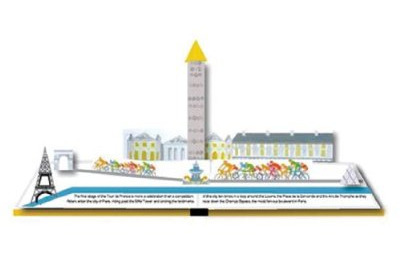 The book allows kids to follow the Tour competitors through the French countryside, up into the Alps, those 13km of bone-crunching cobblestones and then Paris for the finish line. There’s a simple map of France overlaid with erasable acetate so you can plot the route and then wipe it clean in time for next year’s tour. Along the way they can learn about cycling history, fun facts, basic rules of the race, a glossary of French terms and strategies for winning the Yellow Jersey. You can purchase an English version from Amazon or the official French version here.